I am a NZ artist who has called Sydney home since 2003 after living in the UK for 14 years. 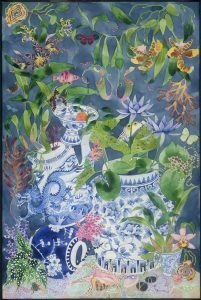 You may be familiar with my still life images: flora and fauna viewed and grown in NSW Australia with more than a hint of chinoiserie. My work could be interpreted as purely decorative. By using allusion and symbolism, I weave stories into my work based on my experiences as trans-racial, Asian adoptee. There are some terse messages in my work but these are tempered with engaging and lavish imagery. Many of my images are of things I have bought, eaten and picked in Sydney: items familiar to most viewers but with a subtle twist. A joyful and chaotic assemblage of blooms and fruit displayed with a collection of ceramics from anywhere and everywhere but with a narrative that draws the viewer in for a second look. The result is a collection of pictures combining unexpected elements to create strangely familiar images. There are stories to each of my works that lift them from the purely decorative into a narrative piece. As we become more and more urbanised, the gardens we remember from our childhoods become rarer. This is an unashamed escape to the gardens of our memories, imaginations and fantasy. A garden can be anywhere: underwater, after dark, in a jar. They are all precious to someone.